It was during Verdi’s presence in Paris in 1855 for the production of Les Vêpres Siciliennes that he accepted a commission from the Teatro la Fenice in Venice for the 1856-57 season. He decided on the subject of Simon Boccanegra, based like Il Trovatore on a play by Guttiérrez. It was an ideal subject for Verdi, involving a parent-child relationship and revolutionary politics in which the composer had always involved himself in occupied Italy. Given the political background of the subject, and despite the action being set in 14th century Genoa, the censors gave Verdi and his librettist, Piave, a hard time. The composer held out and the opera was premiered on 12 March 1857. It was, in Verdi’s own words ‘a greater fiasco than La Traviata’, whose failure could be attributed to casting and was quickly reversed. The critics of the time wrote about the gloomy subject matter and the lack of easily remembered arias and melodies. A production at Naples went better but that at La Scala in 1859 was an even bigger fiasco than Venice. The composer had moved his musical idiom much too far for his audiences and he wrote ‘The music of Boccanegra is of a kind that does not make its effect immediately. It is very elaborate, written with the most exquisite craftsmanship and needs to be studied in all it details’. Verdi’s regard for his composition, and he was his own sternest critic, meant that although the work fell into neglect, the possibility of revision and revival was never far from his mind. In 1880 the composer had written nothing substantial since his Requiem in 1874 and no opera since Aida ten years earlier. His publisher, Ricordi, raised the subject of a re-write of Boccanegra. Although in private he was seriously considering Boito’s proposals for an Otello opera, in public he gave the impression that he had hung up his pen. When Ricordi told Verdi that Boito, who was providing him with synopses and suggestions for Otello, would himself revise the libretto, the composer agreed to undertake the task. The secret project codenamed ‘Chocolate’, in fact Otello, was put on hold but not forgotten. The revision was a triumph at La Scala on 24 March 1881 and it is in this later form that we know the opera today and which is featured on this recording. The story of Simon Boccanegra concerns the political conflict between the Patricians of Genoa lead by Fiesco and the Plebeian faction. Fiesco’s daughter Maria has loved the eponymous corsair and borne him a daughter. Simon wishes to make peace with Fiesco and marry Maria. Paolo Albiani and Pietro, members of the Plebeian faction propose to nominate Simon for Doge, but he refuses until persuaded with the thought that if he were Doge Fiesco would be unable to thwart him. But it is too late as Maria has died and her daughter, in Simon’s care, has disappeared. Later the missing daughter is discovered as the unknowing ward of Fiesco. Simon discovers the fact after promising her hand to Paolo as reward for helping him to power. His reversal of that decision sets the scene for her later abduction. Simon, as Doge tries to placate the differences between the parties in the new scene that Boito added (CD 1 trs. 14-17 and CD 2 tr.1). This scene, added by Boito, takes place in the Council Chamber and is one of the mature Verdi’s most dramatic musical creations. Its music is very clearly a near relative of that in Otello. Its drama contrasts sharply with the first scene with its quiet E major chords that are so evocative of the sea and flowing tides (CD 1 trs.1-2), and that which precedes Amelia’s Come in quest’ora bruna (CD 1 trs. 7-8). They reflect Verdi’s intimate knowledge of a town where he and his wife spent most winters and owned an apartment. As well as the addition of the Council Chamber scene there are many other differences between the 1880 revision and the 1857 original that make comparisons captivating for Verdi enthusiasts. A recording of the original version of 1857 is available from Opera Rara. The orchestral colours and the drama of the plot are paramount in any performance of this opera. On record the outstanding studio recording of the work is that so marvellously conducted by Abbado and featuring Pierro Cappuccilli as Boccanegra in one of his best-recorded portrayals (DG Originals). That 1977 recording was made in association with staged performances at La Scala. In this New Zealand recording the work benefits greatly from the frisson of a live performance adding to the idiomatic conducting of Marco Guidarini whose contribution can stand beside that of Abbado, a sublime interpreter of those Verdi operas in his repertoire. 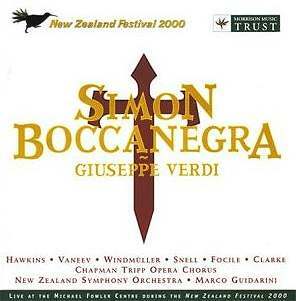 But a performance of Simon Boccanegra stands or falls on the singing of the eponymous part. On this recording Gordon Hawkins, not a name previously known to me, fills every histrionic and vocal requirement to give a consummate portrayal whether as loving father (CD 1 trs. 11-12 and CD 2 trs 6-7), imperious ruler in the Council Chamber or in making his peace with Fiesco and nominating Gabriele, his erstwhile enemy, as his successor as he dies from Paolo’s poisoning. I find that Hawkins has sung in America and Europe but not, as far as I can see, at the ‘best addresses’ despite good notices. His portrayal here denotes a considerable Verdi baritone, a species of some rarity! Boccanegra’s foe Fiesco, is a singer listed as Vladamir Vaneev. He sings his opening aria A te l’estremo addio…Il lacerato spirito (CD 1 tr. 4) and concluding phrases of the opera as Fiesco announces the death of Boccanegra to the populace with steady sonority, secure tone and gravitas (CD 2 tr. 13). He is not so successful at characterisation in the inter-personal scenes such as when Fiesco meets Gabriele who tells Fiesco of his love for Amelia (CD 1 tr. 10) and I wondered where his true fach lies. Is he the same Vladamir Vaneev who is a member of the Mariinsky Company, and is designated bass-baritone? This singer has appeared as The Grand Inquisitor in 2000 in Bonn, Boris (Venice, La Scala, Lisbon) and Wotan in Die Walküre. If so then my thoughts are confirmed that his is a solid voice but not a natural Verdi cantante. That being stated, his contribution here is no great weakness. Nuccia Focile, as Amelia, is the only native-born Italian in the cast. Her light, bright soprano is well suited to the role and her singing well characterised. She may not have the tonal variety or richness of New Zealander Kiri Te Kanawa in Solti’s otherwise undistinguished recording, but her singing is fully able to express Amelia’s variety of emotions as she first recognises her father, is later spurned by her uncomprehending lover and finally in the pain and glory of the final dénouement. Her real life husband Paul Charles Clarke takes the role of her lover, Gabriele; both are stalwarts of Welsh National Opera in the UK. His tightly focused bright tenor is musical and fills Verdi’s demands for lyric singing and dramatic outbursts to the full. He could well pass for an Italian tenor, a fact perhaps related to some home tuition. Yaron Windmüller who is variable in tone and steadiness portrays the nasty Paolo, rising well to the conclusion to the Council Chamber scene when Simon calls upon him to curse the abductor of Amelia, which is he himself (CD 2 tr. 1). As his fellow conspirator Pietro, Martin Snell is a little gruff at times. The chorus sing with plenty of enthusiasm but lack, inevitably but noticeably, some degree of Italianata. The recording is vivid and warm. Applause does not intrude into the dramatic flow, being restricted to the end of acts; a commendable practice. I enjoyed this vibrant performance and the New Zealand Festival should be proud of its achievement. With the benefits of a live performance, idiomatic conducting, and a vibrant recording allied to an outstanding portrayal of the title role, this recording thrilled my Verdian soul, as I am sure it would have warmed the great man himself.